It is winter as I write, and the snowflakes outside my window awaken in my mind a scene from Hans Christian Anderson’s The Snow Queen. When Gerda tries to run forward towards the Palace, an army of snowflakes arises in front of her. They grow larger and larger, and she realizes that the snowflakes are alive: They are the Queen’s guard. The “monstrous” snowflakes take the shapes of porcupines, snakes, and bears. At this moment, with terror and cold threatening to consume her, Gerda prays the Lord’s Prayer. As she says the words, she can see her breath, and it freezes into a cloud that grows thicker and thicker around her. Then the cloud becomes an army of bright angels with helmets, swords, and shields, and by the time she finishes the prayer, a whole legion surrounds her. The angel army slivers the snowflakes into a hundred pieces. Then the angels touch Gerda’s hands and feet so that she no longer feels the cold, and Gerda walks “fearlessly and undauntedly” toward the Palace of the Snow Queen to rescue her beloved friend. The fairy tale is beautiful and captivating, but I have read many fairy tales that are also beautiful and captivating whose scenes have not been impressed upon my mind as this one has. I believe the reason this scene stays with me is that, beyond being a literary treasure, it is a spiritual treasure. It is holy. When I read it, or even think about it, I can feel the holiness in it. I feel the power of the warm prayer breathed into the cold air, and the protection of the angels that surround not only Gerda but all of us who pray those warm words into cold terror and receive the grace that they invoke. When we gather children around us and read stories like this aloud together, a tangible grace descends upon our families. In a word, we become, as I have written about before, childlike. And when our hearts are childlike—as Jesus told us to “become like children” in Matthew 18:3—we are more ready to enter into his Kingdom. In this light, I would like to suggest seven children’s books that families might enjoy reading aloud together during the Lent and Easter season. These titles are some of my favorites; yet I am sure, too, that other families have more gems in their collections, waiting to be pulled off the shelves and lovingly read once more. Three trees dream of what they want to be when they grow up. One wants to be a treasure chest that carries precious gems, but it becomes a manger. The second wants to be a strong sailing ship fit to carry kings, but it becomes a simple fishing boat. The third wants nothing more than to stay planted and be so tall that everyone who sees it “will raise their eyes to heaven and think of God,” but it is chopped down and turned into long lumber beams. It seems the trees will never become what they hoped—until a precious Baby is placed in the manger, a King climbs aboard the fishing boat and calms a storm at sea, and the two crossed beams on a hilltop make everyone think of God’s love. In Oscar Wilde’s classic short story, a mean, selfish Giant chases children out of his garden—until a small boy softens and transforms the Giant’s heart. Years later, the boy returns, with wounds on his hands and feet, to bring the kind and gentle Giant into Paradise. Several versions of this story exist; The Children’s Book of Faith, edited by William Bennett, contains a lovely rendering of the story, among a compilation of other Christian stories and poems. During Lent, many children are preparing to receive their first sacrament of reconciliation. For all of us, adults and children alike, confession prepares our hearts to receive Jesus in his Body and Blood on Holy Thursday, to venerate his cross on Good Friday, and to celebrate his Resurrection on Easter Sunday. This beautiful book by seasoned catechist Suzanne Lewis leads readers to a deeper understanding of the sacrament through Scripture verses, beautiful artwork, and connections to the liturgy and other sacraments. Reconciliation is foundational to the Easter message. The author asks gentle questions and provides thoughtful explanations that lead children into the heart of the Father’s love for them in this wonderful sacrament. Jesus referred to Jonah’s sojourn in the belly of the great fish as a sign of greater things to come. 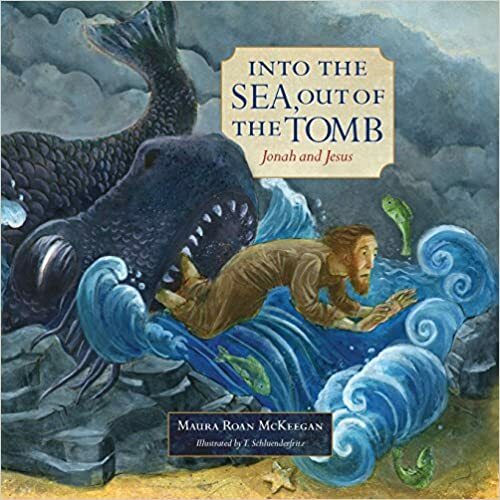 This picture book, with beautiful illustrations by Ted Schluenderfritz, tells the stories of Jonah and Jesus side by side, so that readers can discover the parallels. I wrote this series to help children understand what Saint Augustine meant when he said, “The New Testament lies hidden in the Old, and the Old is unveiled in the New.” In the newly-released Into the Sea, Out of the Tomb: Jonah and Jesus, and in its award-winning companion The End of the Fiery Sword: Adam & Eve and Jesus & Mary, children can see how the Paschal events, signs, and symbols of Holy Week and Easter were prefigured in the Old Testament and fulfilled in the New. In Eastern Europe and Russia, decorating pysanky eggs is a cherished Easter tradition. The first time I tried it, instructed by a Polish friend, I was astonished at how difficult the process was for me, and I could not believe anyone could get eggs to turn out as breathtakingly gorgeous as the ones I had seen displayed. I couldn’t even prepare the egg shell right, let alone use the tools to melt beeswax in intricate designs! Pysanky is an art of patience and skill—a cultural masterpiece. This book weaves a simple, sweet story around the pysanky tradition, and with lovely pictures gives us a glimpse into the life of a young Ukrainian girl named Anya and her family as they prepare to celebrate Easter together in the early 1900’s. Have you ever wondered how to bring home the idea that Easter is not just one Sunday long—that the Easter season lasts 50 days? This unique sticker book—illustrated, like Petook, by the legendary Tomie dePaola—offers families a great way to celebrate the whole Easter season. It comes with a large fold-out scene of a garden, reusable stickers, and a booklet. Each day, the booklet provides a Scripture verse, a meditation, and an explanation of what that day’s sticker represents. For example, on Day 4, the Bible reading is about Jesus the Good Shepherd; the meditation explains what a “gate of the sheepfold” is and how it relates to Jesus; and the sticker is the gate. Each day, children can place a new sticker on the garden scene, and seven weeks later at Pentecost, the “Garden of the Good Shepherd” will be filled with symbols of what they have read about in the Bible. All of these suggestions are, of course, meant to accompany the rich liturgical traditions already in place in the Church. For centuries, children have awaited Easter by attending Mass, praying the Way of the Cross, and reading passages from Scripture, and these things are irreplaceable in this holy season. Yet the gift of Christ’s Passion, Death, and Resurrection is so big, so great, so enormous and deep and wide and high, that there is always room for us to enter more deeply into it, to grow closer to him through it. I believe that one way families can do this is by reading aloud together books that unite us, increase our sense of awe in God’s goodness, and enable us to sit together “as little children” (cf. Matthew 18:3) who long for his Kingdom to come. For sometimes, when we’re sitting with our Bible, our family, our friends, and our stories, we suddenly understand that Jesus is very, very near.